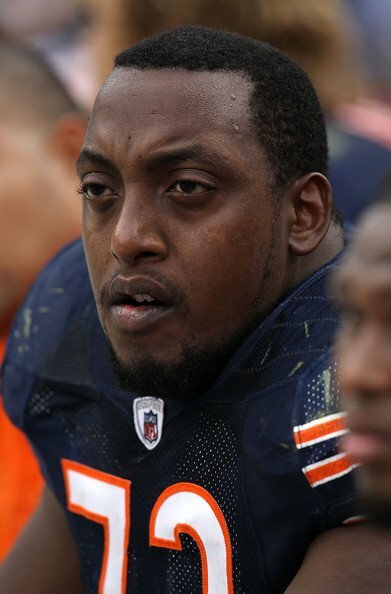 Chicago Bears offensive Tackle J’Marcus Webb was arrested Sunday in Pulaski County on drug charges, but the county’s top attorney has decided not to prosecute. Webb was stopped for speeding by sheriff’s deputies Sunday evening on Interstate 57. Police discovered cannabis in Webb’s vehicle, and he was charged with possession of a controlled substance, cannabis and paraphernalia. Pulaski County State’s Attorney Grayson Gile said Webb had 2.5 grams of marijuana in his possession when he was stopped for going 11-miles-per hour over the speed limit. Since the arrest, Gile has classified the case Nolle prosequill. The term refers to a formal entry on the record by the prosecutor declaring he will not prosecutor further. Gile declined to comment further on the case. Webb made a first appearance in Pulaski County Court Monday where he paid $500 cash bond. The case had been set for a March 18 hearing, but Gile said that hearing won’t be necessary. I remember this guy. Jay Cutler got in his face during one Bears game last season for a stupid illegal motion penalty, if I recall. There were moments I though Webb didn't seem focused. Now I know why. The prosecutor was probably a little confused, he probably thought Webb was a Gay Illegal Immigrant from California for which no laws apply. Honest mistake, right? a gay illegal immigrant!! too funny! you do realize that gays are persecuted in this country..whether illegal or tax paying citizens...just like you do! Just another case of if you know someone, or famous, you can get away with anything. I would love to compare other cases in this county with the same charges and see what the "average joe" received!